Tibetans have been drinking buttered tea for more than 1,000 years, and have been practicing and perfecting special buttered tea making and drinking rituals over the same period. Buttered tea, Tibetans' traditional drink, is a necessary daily food and also an excellent drink for entertaining guests. To make buttered tea, first boil brick tea in water for a long time into red thick juice. Then pour the juice into a specially made round wooden pail, and add the desired amount of butter (oil extracted from milk of cow or sheep) and salt. Use a special stick to beat the tea up and down vigorously in the pail to completely dissolve the butter and tea. Then pour into a pot or boiler and put on a low fire or burner. Soon the tea is ready for serving. When drinking buttered tea, Tibetans use different kinds of bowls, including ceramic, silver, jade, and wooden ones. 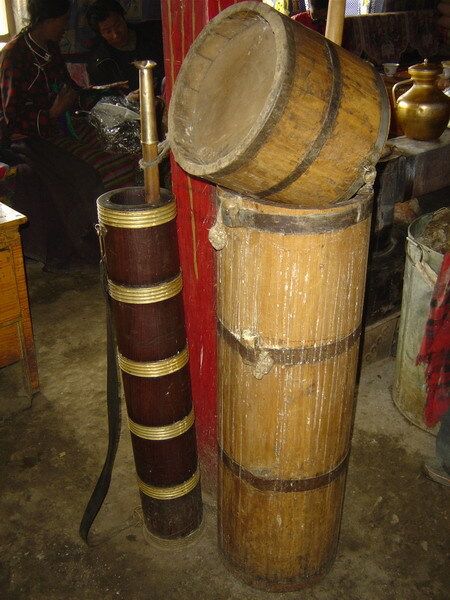 Ordinary Tibetans use mainly wooden bowls. Buttered tea is a very nutritious drink that is suited for high and cold regions. It can resist coldness, promote body fluid as well as quench thirst, and eliminate fatigue. Tibetans eat mainly meat such as mutton and beef; as eating too much of such meat can lead to a high acid content in the blood, drinking buttered tea helps balance acid and alkali in the body. Tibetans usually drink several cups of buttered tea in the morning before going to work. There is a custom to follow when drinking buttered tea. When the host fills the bowl for the guest, instead of drinking it at once, the guest should first chat with the host until the host lifts the teapot for the second time -- at this moment the guest can take a sip of the tea. According to the Tibetan custom, the buttered tea is drunk in separate sips, and after each sip the host refills the bowl to the brim. Thus the guest never drains his bowl yet it is constantly topped up. If the guest does not wish to drink, the best thing to do is leave the tea untouched until it is time to leave; at that moment the guest should down the bowl, except for a little amount. In this way, Tibetan etiquette is observed and the host will not be offended.